Yes, I know I’m behind on my ABC’s, but that’s life. I use the wool of these magnificent sheep in more and more of my knitting, particularly socks. It’s just there — being made into wonderful yarn and dyed with beautiful, enticing colors. It’s soft, and bouncy, and takes color like nobody’s business. It’s delightful to spin, though it needs careful preparation. It can be lustrous or almost matte, depending on how it’s spun. Merino can be Superwash, too, which makes knitting socks all that much better, because I can wash them in the machine. Merino is good. It’s Wednesday already (and Wednesday is almost over) and I haven’t done much besides work. Work easily consumes eleven hours a day. There have been a few tiny and annoying crises, many customers, and by yesterday afternoon I’d ordered approximately 1,500 books (we tally the purchase orders just to torture ourselves, and so we’ll have an inkling of how long it will take to receive and shelve each day’s shipment). Thank goodness my commute is about fifteen minutes, or I’d never be at home! I’m knitting a little, and I’ve spent part of this day off finishing the Calla Lily socks — a few rows to go and then I can toss them in the wash and block them (they’re Superwash Merino, after all!). Knitting: Socks and the Flower Basket Shawl and oh, whatever — check. Spinning: More of that lovely Merino from Blue Moon, and the rest of the Targhee/alpaca/silk/cashmere from Spirit Trail — check. Sustenance: Blueberries, definitely blueberries — check! Sweet Jane,Your post made me relax – reading about Merino did that – who knew?I aahed & oohed – just what I needed.Love the summer ideas – good to think of one’s sanity when all about one, people are losing theirs.Can appreciate the orders & the customers, shoppers & crises. Can we compare notes sometime? Off line of course.XOXO to you & the furry girl. Maybe you should try to figure a way to come to HB knitting circle it would force you to relax for a couple of hours. 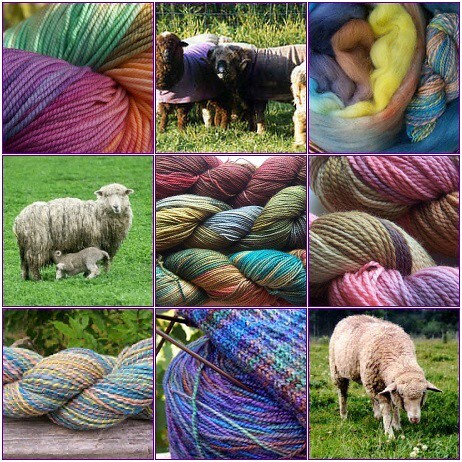 What a lovely merino color – both the “on sheep” & in skein pics. 🙂 Hang in there! A lovely mosaic! Your plan for maintaining your sanity sounds good to me. Hi Jane 🙂 Since I am new to your blog my curiosity is peeked by your order for 1,500 books! Do you own a book store?Love the photo collage! Love the pics especially of the sheep themselves. Sending you energy to help you get through the season of summer people. I, too, have a Plan to Stay Sane. That yours includes blueberries is perfect in so many ways. Take care! Being an Australian I know all about Merino sheep and their lovely wool.